I recently visited the Medieval Crime and Punishment Museum in Rothenburg ob der Tauber, Germany—a museum which houses a large collection of instruments of punishment and torture. However, some of the most chilling artefacts weren’t designed to inflict physical pain; they were used to publically humiliate and shame. 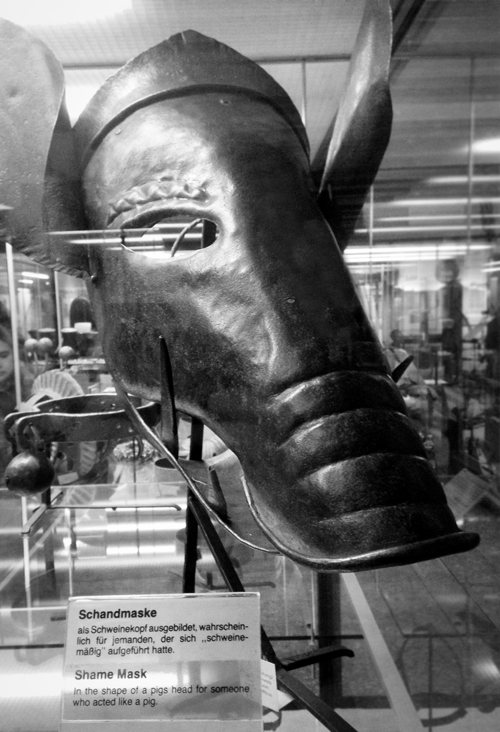 On display was a ‘Swine Mask’ for men who were pigs to women (which doesn’t sound like such a bad idea in a post-Weinstein era). Then there was the ‘Hood of Shame’ given to students who misbehaved. (Again, as a teacher, that sounds good until I think back to my performance as a student.) There were grotesque costumes for drunkards, gamblers, gossipers, fornicators and the foulmouthed. (So, no fun to be had whatsoever in the medieval period then). “The flute was used for shaming bad musicians,” a plaque explained. How bad would your playing have to be to deserve such a punishment? As a musician, I am so lucky I didn’t live during the medieval period. That’s not to say that I haven’t been publically humiliated at times. But it’s something I’ve been able to do on my own, and without specialist equipment. A recurring nightmare I have is that I’m onstage and I have no idea what I’m doing. I don’t know where I am or why I’m there. I don’t know any of the songs and everyone—the other musicians and audience included—is waiting for me to start playing. Even though I haven’t performed in public for a while now, I still have this nightmare at least once a month. It’s the musician equivalent of dreaming you’re back in class high school, buck naked. There’s no worse feeling than being in front of a crowd and feeling hopelessly inadequate and underprepared. It’s no wonder so many never venture from the sanctuary of their bedrooms and garages, safe from anyone who might see or hear them play. Back when I studied music, I used to practice up to eight hours a day. I can’t image that luxury now. However, I don’t think all of that time I spent practising was very effective. My guitar teacher back then used to say, ‘If you sound good when you’re practising, you’re not practising.’ I probably nodded every time he said it, but it wasn’t until years later when I lived with another musician that I really understood what he meant. For a time I lived with a good friend, a brilliant musician who was then just starting to tour all over the world. When he was home, he was a great housemate—a really sweet and generous guy—but it took me awhile to get used to hearing him practice. I’d often hear him with a guitar playing the same phrase over and over and over again. I love listening to people practice. Well, I thought I did. I hate to admit it, but after a while I found it really f*cking annoying. The repetition was maddening. However, one day, after having the same guitar lick had been slowly boring its way through my brain, I got it. I realised that this whole time I hadn’t been practising properly. The difference was my friend wasn’t performing. He was working. He was turning difficult fragments into effortlessness muscle memory. In comparison, when I practiced, I sounded good, but it was a form of self-delusion. I wasn’t practising—not really. I had no patience to stick with the difficult parts. I preferred to revisit stuff I already knew. I was playing to entertain myself, trying to feel good about myself, not learning anything new. And suddenly I realised the secret of how my friend was such a great musician—in private, he wasn’t. He worked at it. After that, listening to him practice wasn’t so annoying. Effective practice often means playing the same difficult phrase slowly over and over until your fingers ache. It involves putting your hands in painful unfamiliar positions, enduring your own mistakes, and allowing yourself time to make slow torturous passage through the awkward and awful. Time alone developing your art is about biting off tiny digestible chunks of the world. It’s slow, difficult work. But over time, our capacity to endure in private what makes us vulnerable helps us better withstand the slings and arrows of the world. The more we’re willing to don the ‘shame flute’ at home, I guess, the less we risk having to wear it in public. And to do that we have to be willing to endure the awful, the amateur and the cringe-worthy to arrive at the beautiful, the interesting, the transcendent.